So much has happened to me playing StarCraft in the past few months that I want to write about. A journey of hope, soul, and hardship was had. I decided one day to reach my highest level of play, a last shot at "going pro" before real life responsibilities would overtake me. I didn't make the decision on a whim though. I wanted my play to coincide with the coming of the 4 Qualfiiers for the NA Zotac Cup and the general springing up of tournaments from the release of SC:R. In what would most likely be the last gold rush of competition any foreigner could hope for, the opportunity was not one I could pass up. From the numerous defeats, successes, but mostly defeats, I have become humbled and learned so much about exactly how bad I am. It was a great experience. To begin, when I first heard about zotac cup I couldn't think of a larger opportunity for what felt like free money. To have a 20k prize pool isolated only to North and South America could not have been a better calling. All of the scary Europeans that crowd the top of the foreign scene would be completely excluded. On the other side of the sea, I can try to edge out the few competitors that remain in North America. So I set off focusing most of my efforts playing StarCraft. I deferred school responsibilities for the time being. The semester I was in was the least intensive, and the semesters after were only going to ramp up several fold. If there were ever an opportunity to live out my dreams of playing competitively, it'd be at zotac cup. Leading up to that event there were so many factors that influenced me. How I even felt confident in the first place that I could qualify among the top NA players was my tournament success before. Now, in terms of good NA players that number is about 2, so I thought I had a good chance until more names started appearing from the brush just for Zotac Cup. As for my tournament wins, I'm not sure if success is the right word. I would win some events, but often times I felt like they were handed to me. Something about the foreigner scene is low skill and it just feels like it's lacking something essential compared to the Koreans. Tenacity? Drive? Also, people in the foreign brood war discord kept saying I'm pretty good, so I must be, right? our newest recruit who is a current top amateur, Ty2 will analyze Gold Rush. The moment to top them all though was during a broadcast of an SK Clan Weekly tournament, probably one of the first three. Unfortunately the broadcast is lost to time, but what was said on that day was unforgttable. Someone accused me of hacking after I beat them, and DocHoliday, bless his heart, overdefended me on stream, saying something along the lines of, "Ty2 has no reason to hack. He's the smartest, most handsome, most skilled, strongest, greatest ever NA Zerg." The handsome part may not have been there, but that is what Doc said for the most part. When I heard his words, I knew...I just knew I made it. Funnily enough the tournament casters really overhyped me. I was against poor competition in the first few tournaments to the point that I gladly 5 pooled almost half of my games, if not more. They took that as a sign of me being good. So, yah, I was pretty good. Even before Zotac I accrued my first big win that I proudly flaunt, which is my TL Open #2. I've never wanted to win something so bad, not even as bad as Zotac funnily enough. While the finals was definitely a fluke, actually, almost every game was a fluke; a series of flukes. I still managed to win somehow. Road to relevancy not quite, but it was something to feel good about. I was in a state of disbelief that I had come so far from just two or three years ago. To have confidence in myself that I can contend near the top of the foreign scene (which isn't actually a big accomplishment) felt very unlike myself. I would wonder at times how I got here, but it's incredibly hard to point to any exact moment or week as progress is incredibly gradual. It's like taking a long walk and at the end of the journey you finally have a mirror to hold up to yourself to see how you've changed. I walked away not only with confidence, but $100 from TL Open. 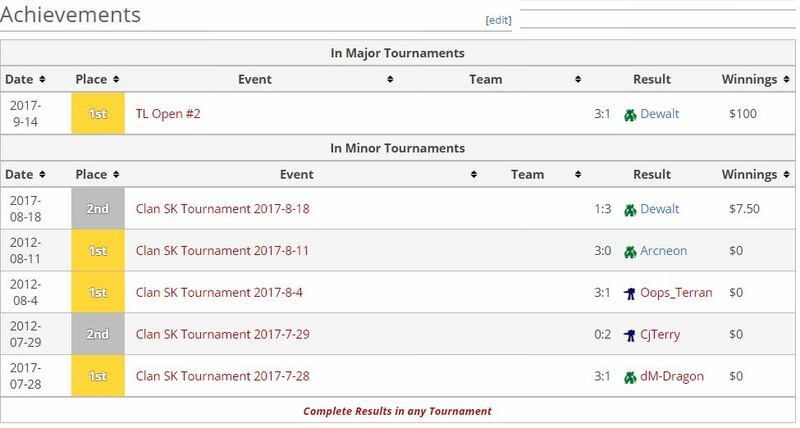 Other tourneys began popping up from SC Remastered like the SK Clan Weeklies, occassional zotac cups, and the Clash For Char tournaments. Just placing 3rd or 4th got me some good pocket money. At some point though, I saw the money as more than just pocket money. A very silly way of thinking, I thought like that because I didn't really make any money. I'd become familiarized enough with how money works in real life, like how you could exchange it for goods and services, and exactly how much is actually a lot. I knew that in the back of my head, but I really saw these tournaments as not just an opportunity to have fun, but a way to make something of all of the hours I've put into the game. Now, just imagine that feeling of enjoying the $100 dollar prize pools multipled by one hundred. Pushing school aside, I put my entire being into the game. I was obsessed with my ranking on a recent foreigner ELO website someone had made. And as my rank climbed, so did my ego. It's dangerous exactly how much the mind can convince itself of something. For me, it was the idea of being good, and the idea got to my head and manifested in negative ways. I'd subconsciously reason I should beat someone mostly for the sake of my reputation. When people say I'm good, and I don't feel that way, I'd kind of feel like I'd be letting them down if I lost to some random player, or even lose consistently to top players. The feeling of being a "top" player was surreal at times. The biggest pressure I faced though that would come up time and time again was feeling the need to succeed or else the hours I've played would be meaningless. That feeling would come to swell inside of me as time drew on. For practice, the first thing I'd do after getting home from school was play StarCraft. I can't tell you how many hours of muta vs. scourge micro and build order practice I'd do before even touching multiplayer. I'd do even really mundane things, like lining up my lings perfectly, seeing how fast I could do it, or forming concaves on ramps for ZvZ. You could fit a solid 8 lings on ramps, but I'd only manage 7. I practiced my ZvZ especially because of the player Michael, who I saw as my biggest competition. I also, on rare occasions, liked to flesh out map specific build orders. I always found that important, especially for series play. Funnily enough there were so many distractions I had while I played, like watching twitch streams, listening to music, and browsing forums. I also never got into contact with some practice partners or practiced on the specific maps of the tournament outside of what was already in the ladder map pool, which was a huge mistake. I've won some tournaments just by having better map knowledge than my opponent who wasn't as well prepared for the map that's not Fighting Spirit or circuit breaker. Evidently, I made a lot of mistakes like that where I just wasn't thinking. During that time of ill-preparation, I enlisted the coaching services of Scan, a top player who had a long history in the foreign scene and was competing with Koreans already. The investment I made was $200 from my tournament winnings. The cost was hefty for me, but with my desire to get better at StarCraft and qualifying for zotac, the coaching was worth the cost. In my lessons, I learned a lot of insights about StarCraft - not just pure knowledge, but I dramatically rethought how I looked at the game. I also drew some closer impressions of Scan on how he improved far beyond the top foreigners now. At around the same time, I bought the book "The Mental Game of Poker" by Jared Tendler. The book is widely regarded as a staple of teaching not just poker, but mental game lessons of pretty much everything. Reading that book, I realized just how huge of a deal the mental game is in not just competiton, but everything, and also how much the pitfalls described in the book so accurately described my own play. The important part was to become aware of your weaknesses, identifying them, how people perform and operate, and so much more. In Day9's podcast, "Having a Good Mindset," which I remember by heart, he brushes on similar points that I grapple with all the time. The first point Day9 talks about is to always have a game plan. I cannot tell you how many times I've made last second decisions or thrown my game plan completely out the window. Sometimes it'd work, sometimes it wouldn't. I realized this was a weakness of mine, and I cannot tell you how many times I tell myself before a big game or in practice not to throw away my game plan in favor of something I think is a good idea, only to then do exactly that. So many mistakes I made like that were ones I worked on as I read the book. With the book in tow, I felt ready to maximize my learning with Scan's coaching. I remember one of the most important lessons was teaching me ZvT. I had the reckoning during the first Zotac Qualifier that my standard ZvT was seriously lacking. It was vs. KawaiiRice, not a big name by any means, but I lost so incredibly underwhelmingly. I realized up to that point in ladder games I had been playing mostly zergs and protosses, and the few versus Terran games were often haphazard, veering away from standard play. I had managed to play a single good ZvT I think that entire month. I realized at that moment I sucked really bad at ZvT. At this point I made the revelation that you could rally 3 hydras to your ramp to a far-away third, saving up three larvae, so you had 3 lurkers at your 3rd. It only took 7 years to learn it. I was pretty good. I realized at that time I had to work harder to get to the macro game, because there were so many concepts in ZvT I only had a rough understanding of that I couldn't apply smoothly in-game. Each game I'd have to fight to work through my rough understanding. I learned from the poker book that I needed to drastically improve my B-game, the game I'm consistently going to be able to show. One of the first essential lessons I learned was the importance of gas timings. There's significant differences of getting your gas, at say 12 supply and 13. There's also the concept of optimized build orders which I didn't truly understand. The measurement for such BO's to be called optimized was precise to the second. Your spire has to complete by 6:03, not 6:05, not 6:10, 6:03. I carefully saw the difference in minerals I'd get later on, and the timing of my own spire as a result of my gas. I even started looking at the effects of getting two pairs of lings at 14 supply instead of 16. There are tremendous changes. Here Scan described Zerg as a fun race to arrange different parts of an equation. There's A + B + C = D, C + A + B = E, and different assortments, just from something as simple as getting your gas at 12 instead of 13 or 14. There were so many larger things I learned about Zerg. I think a rather simple, but most profound concept was stopping at 2 carapace, 2 melee upgrades, because you want to use the resources to be active on the field at that time. That one got to me. It seemed so simple, but I didn't know about it at all in my years of playing. There were a lot of things I learned like that from Scan where as you notice x, you have to notice patterns of y and z occuring as well. There's always some rationale behind such things, and I learned to more carefully observe motives behind every action. During my lessons, I also inquired a lot about how Scan improved as fast as he did, so I could try to improve the same way. I guessed that he must've learned from some Korean guides or lessons from players. That wasn't true to, much to my surprise. He learned from careful observation of others and his own experiences. In a lot of ways, I think he was reinventing the wheel in his own way, having to learn these things for himself with few resources. I gained a lot of respect for Scan as a self-made player, and I gained a greater appreciation for StarCraft as a game of high intellect. As my training made me feel sort of better, I was sort of ready to tackle qualifier #2. I lost to Michael in the loser's final bracket. It was a sad time. It was on Tau Cross and I lost 12 pool to 9 pool. I even had a good hunch he'd 9 pool, but I made a classic mistake. I overextended w/ my drones, a mistake I usually never do. After that, I started losing my patience to defend a lot. Even though I practiced a lot, I realize that my performance out of tournament means nothing if I don't have the mental strength to translate that in-game consistently. It was also very late into the night, 5+ hours into the tournament. I remember having such a headache. I realized then that endurance is as much a part of tournament play as any other. In that regard, I failed badly. I realize in practice I played very few games in a day, and often took long breaks in-between. So with that in mind, I tried to condition myself to practice more consistently with no breaks. I remember trying to have a schedule where I'd play four hours each day without stopping. I still took breaks though unfortunately, and the routine only lasted three days before my lack of discipline took over. With my lack of endurance, going forward, I tried my best to rest in-between series, as in totally doing nothing but lying down. My problems only seemed to increase from there though. With reading the book, playing the game, and getting help from Scan, my hands started sweating a lot. It got so bad that I'd easily leave a sheet of sweat on my mouse and a stain at the base of my wrist on the mousepad. I started using a sheet of toilet paper on my mouse after that. I also felt my mouse accuracy dropping despite making sure to practice on aimbooster. The sensation my arms would feel is hard to describe. They were like noodles and at the same time there was a soft numbness at the center of both. I kept getting frustrated with my physical limits. I reasoned though that I can't make excuses. There's always something I can do to overcome this noodle feeling which I thought was mostly mental. I started doing wrist exercises and stretching my hands out. Many months after I realize though I should've eaten better and exercised more. I was subsisting on rice, oatmeal, soy sauce, frozen tukey burgers, fruit gummies, and soymilk. At the time I was blind to my obvious lack of nutrition. My performance on ladder wasn't encouraging either. As I attempted to play more macro oriented, consistent styles, I started realizing just how little I know about playing StarCraft. As my opponents got better, so did their ability to deceive and do more and more clever tactics and strong builds that abused my gaping flaws of defending aggression and identifying cheeses. To be so bad at these parts of the game this late into playing made me question if I was really going to qualify. When qualifier 3 came about, I was pumped. I went to the finals that qualifier against nyoken. I had advanced from the loser’s final which nyoken sent me down to. I was at ease though, with a trick up my sleeve I hadn't revealed yet. However, My zvt at the moment even though I learned from scan suffered from lack of practice games and nerves. The ace in the hole I had prepared for nyoken was a four hatch before gas play that was to counter nyoken’s build. I learned the build from aegyo. The build abuses his lack of early map control by droning and relying on zerglings to defend. I made a critical mistake though, one I’ve mentioned I always make. I made a last minute decision. Now, this wasn’t in game, but I had decided to use the build the day of the tournament with no prior experience. I had little experience playing against terrans, much less using an unorthodox play. To use the new build was unwise, and moreso because I lacked good understanding. One of the essential components I failed to understand was tricking the terran into thinking you’re playing standard. But I failed to do that. I showed my hand so obviously with a very late gas. I went for a later gas based on a slightly botched execution of the build in aegyo’s replay. I reasoned I wanted my drones nonstop mining gas. The proper execution though is to get an early gas to make the build look standard, and then pull drones later. Besides my own build, there were so many flaws in my opponent, nyoken. I had him paranoid of a pool first, so he’d pull SCV’s pre emptively. It’s a very rookie mistake, and one that creates significant ripples of disadvantage. He also never eight raxed or switched his build up, with the finals games being an exception. The way nyoken was playing was a gentleman’s agreement. I had all of these advantages, but my biggest opponent at the end of the day was myself. So many problems occurred that night, a culmination of all of my flaws. 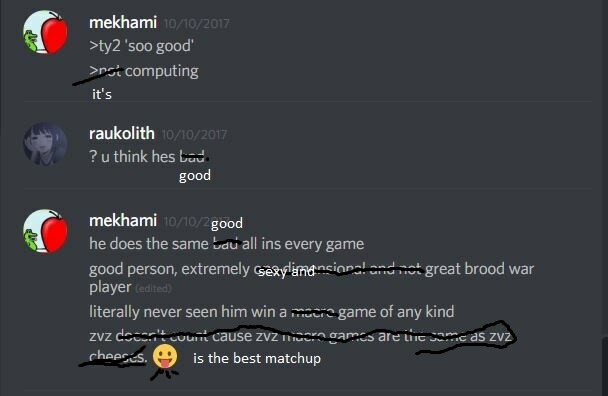 During the series I kept looking at the discord chat before and in-between games. I’d see from the people in the discord server so many words. They were rooting for me, and it put a lot of pressure on me. I've always been concerned about what other people thought of me. The worry of disappointment would sink further when they’d see me do a bad play. It’s that moment where you’re telling the player to do something that seems so obvious to you as the spectator. And I was like “I know exactly how you feel” as I was reading the discord chat. The biggest obstacle however was answering if I wanted to win. That’s kind of strange, but there were so many implications in winning. If I won this qualifier, I’d have to fly to California over three thousand miles, meet all of these people I had only seen online, casters and players alike, compete with 10k on the line, and do all of it alone. For me, the opportunity was unreal and too overwhelming to handle at times. That series I was so distracted on if I wanted to truly win. I had that question answered by the time I was far behind in the series deciding game. I nearly eclipsed the fantasy gg timing. I lost, and had to seriously question myself. I didn’t prepare well for python which is heavily favored zvt. How could I say I took this seriously? Anyway, there would only be one last shot, and the next big contender would be Michael. He lost to nyoken in the previous qualifier unexpectedly. Apparently he didn’t have much time to practice that week. I set off practicing more, but as the days wore on, they became hollow. I had committed already three hard weeks to qualifying. Lingering in the back of my head were so many problems I couldn’t lay to rest while in game. What if I didn’t qualify? What about my schoolwork that was only piling up with every growing day? I had these questions and to calm myself I accepted the possibility of not qualifying. For the most part, the saying worked. Playing in qualifier four, although my health and mouse accuracy felt shaky, I persevered through sheer endurance. I worked my way up to meet Michael in the winner’s final. I ended up losing in a disappointing series. There were gaping mistakes caused by my lack of critical thinking and lack of zvz experience. I thought to myself I can’t truly expect to win like this. In the loser’s final I played against kawaiirice. Winning I thought was a given, but so many problems occurred. The first game was an auto-win. It seems like any lurker first and heavy ling all in wins automatically against kawaiirice. I suspect my opponent’s discomfort playing against unstandard plays were his weaknesses. In the second game, I went standard. By this time I had confidence in my zvt, but a fatal mistake threw me off. Midgame there was a pause to fix some lag, and on the unpause I forgot to make overlords. I ended up getting supply blocked at such a critical moment, so I only had four mutas making when I should’ve had 9. I knew I shouldn’t panic. After all, my favorite pro gamer hero has lost three overlords before and still managed to win against inferior opponents. Unfortunately I’m far more mentally weak, and only made mistake after mistake. The third game was on python, a map I had Iittle preparation on. I decided to go two hatch muta despite going against the repeated lesson to not do something I hadn’t prepared for. I lost that game. And that was that. The end. I sat there in starry disbelief that this was how my journey ended. I was saddened, but at least given some closure that I had tried my best. Michael went on to win handily 2-0 against Kawaii in an underwhelming series. Then out of nowhere a miracle happened the next morning. Because one of the South American qualifiers couldn’t get a visa to the US, there was a spot open. A round robin was held including me, kawaiirice, and ranged. I ended up winning pretty cleanly. But then tragedy struck. Amidst trying so hard to qualify, I had completely forgotten about getting proper ID for interstate airline travel. And just like that, I had thrown away my last shot. Now that one I had a hard time getting over. But wait, yet another miracle occurred. Nyoken couldn’t come, so I had the opportunity to replace him. Unfortunately I didn’t have my id yet still. I remember feeling so bummed and burned out. It was a waste for all of this practice to go nowhere, so I practiced nonstop for the three weekly tournaments that occur. I practiced too hard though and quickly became sleep deprived and my arms were heavily strained. I had early exits in two of the tournaments. Even poorer mouse work, worse decision making, lack of clarity in thought, and of course, the pressure to succeed. I was so discouraged that I didn’t enter the third one and just took life easy. I reasoned I had given all of my effort, and there was nothing more to do. I had plenty of time to reflect on the experience. I remember most of all at the end of it was a bitterness. I had gotten sick of Starcraft - Not just tired like I have many times before, but truly sick to the bone of Starcraft. I realized I had lost sight of what was most important. I play the game for fun first of all. What little money I made was trivial at best. I had the toxic reasoning, if I don’t win now, what will all of those hours of practice be for? Nothing? As I lost respect for the game, the game lost respect for me. I tried to play starcraft again, but the competitive spirit was completely extinguished. I realized money is meaningless in the bigger picture. Even 10k in the long run doesn’t have a huge impact, especially if I put so much stress on myself to win when I can make more money doing a minimum wage job with the time I've been practicing. I might just be sour grapes though. To play for money was silly, but also a way of realizing an opportunity to play my heart out and give my passion a greater meaning. A man can dream. In the end though, I tried so hard only to fail. I realize though that there was a lack of emotional maturity. And through this time I learned more about myself, and gained solace from having a period of time where I gave playing StarCraft my all. At the same time though, I realize I wasn't serious about practicing and I wasn't completely honest with my intentions. If I could do over the process I'd play a set amount of hours, have a schedule organizing my play time, set aside time to analyze later, practice on the specific tournament maps, prepare strategies, scout out my opponents, get practice partners, exercise and eat well, and most of all, establish why I'm doing all of this. I realized though in a very cliche way, I was losing the purity of the game. I betrayed its trust in me. The more I lusted for money, the less my units responded. They peered deep into my soul, and saw only evil. Most of all I realized that any capacity of taking the game seriously wasn't fun for me. I cannot play even four hours everyday of this game and still find it fun. This was a good read. I don't know you personally, but you might be a bit too hard on yourself. While it's good to analyse your actions and figure out where you could have done thinfs better, there is no need to equate every lack of succes with some deep personal flaw. Remember, for every winner in a competition, there must be several losers. You don't have to be bad to lose, just worse than the one you lost too. I hope you refind your enjoyment in the game. Thanks for commenting, Sr18. Yes, I do find that I'm a bit too hard on myself at times and I am definitely getting the hang of having fun with the game more. Damn, competitive gaming can be taxing. I'm glad I gave this a read. Very interesting to see inside the mind of a Starcraft gamer trying to make it in a tournament. Shame you couldn't get ID to make it in time. Would've been nice to see you there. Starcraft E-sports scene might not live forever but I hope we can continue to play for fun at least. Even though you've had success in tournaments before, you've never participated in one with stakes as high as this. I know you invested a lot to make it to that point, but try not to feel discouraged. There will be other opportunities, so use this as a learning experience. Get yourself an ID so that next time you will be able to travel. I feel like one of your flaws is that you put the praise of others on a pedestal. Be the judge of your own play and ignore comments like that from others. Take a break if you need to, but keep doing what you love. Yah, competitive gaming is tough. When you're up against players who exceed and rival your ability, I always get anxious from the unnerving thought of having the person actively work against you. I guess that's the fun of competition though. I was thinking of my experience to be like progamers, even though it was much less intensive. I came to know of disappointment and investing so much into a game only to lose in a world of ruthless competition. I can't say the foreign scene is exactly ruthless or nearly as high stakes though. Most players don't get immense success and that's the bleak truth and risk of competitive gaming I came to understand better. Thank you, Shalashaska. You give good comments as always and I will take your advice to heart. Got pointed to this by harem, and I don't really have anything to add, but I just wanted to say this was a good read. Thank you for sharing your experience. For what it's worth, I have to echo what others have already said. You're being overly harsh on yourself. Not qualifying for zotac could be considered a failure, sure, but failures like that are extremely impressive in their own right (in my humble opinion). You really deserved to qualify buddy. I'm sorry that you didn't. I totally get being down afterwards. I quit playing BW again after failing to qualify. Amazing introspection Ty2. Hope you can continue enjoying the game for the simple fun of it in the future. Sucked so bad you didn't have your ID stuff in order ahead of time. one day he said "I'm gonna be the best"
qualifiers on "let's beat up those geeks"
he said in a low voice. "I know better"
now he reached the final, he is winning! the fairytale happened, yay we can sail!